On April 26, 1822, Frederick Law Olmsted was born in Hartford. 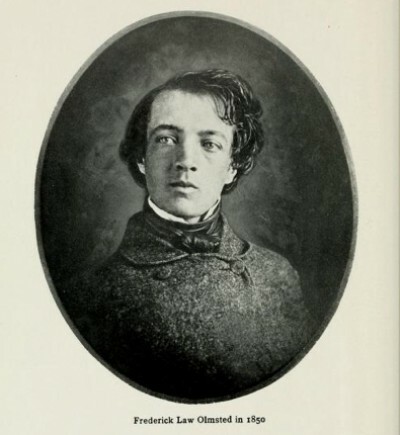 Often described as the founder of landscape architecture in America, Olmsted was also a journalist, author and social critic, especially in regard to free labor. In 1858, New York City’s new Central Park Commission appointed Olmsted the architect-in-chief and superintendent, and he oversaw the new park’s design and construction, eventually realizing his plan of a “Greensward” or naturalistic landscape. Over the course of his career as a landscape architect, Olmsted designed many residential estates, university campuses and parks, including Connecticut’s Walnut Hill Park in New Britain and Seaside and Beardsley Park, both in Bridgeport. …That in the 1850s the Reverend Horace Bushnell commissioned Frederick Law Olmsted to landscape what is known today as Bushnell Park in Hartford. Olmsted, however, turned down the park design to focus on his work completing New York’s Central Park landscape.